Hillary has 52.5% to Bernies 47.4% with 86% of the vote in. The LA Times reports Bernie won the northern Nevada counties that Obama took in 2008, while the Washington Post says her support among African-Americans was very strong, and Bernie did pretty well among Latinos. But according to preliminary entrance polls reported by CNN, she won among black Democrats by a whopping 76 percent to 22 percent. African Americans made up 13 percent of the electorate, according to the entrance poll, while 19 percent were Hispanic and 59 percent were white. Sanders held an eight-point edge among Hispanic voters, who accounted for roughly 1 in 5 caucus-goers, and the two candidates split white voters about evenly. 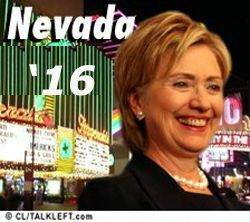 Today is caucus day for Nevada Democrats. Will Nevada Latinos buy into Bernie Sanders? Or will they take a pass? Nevada civil rights activist Dolores Huerta is pushing hard for Hillary. She says Bernie Sanders is a spoiler on immigration. ©ivil right activist Dolores Huerta intercepted potential voters as they lined up to make their lunch orders [at Tacos El Gordo restaurant] and urged them to caucus for Hillary Clinton. "I was reminding them -- these are young Latinos, children of immigrants -- that way back in 2007, we had a great opportunity to pass immigration reform," Huerta said. "And Hillary Clinton also co-authored that bill with Senator [Ted] Kennedy. But Bernie Sanders came out against the vote." "He was a spoiler on the immigration bill and he’s a spoiler in this campaign." Looks like Newt Gingrich fizzled in Nevada and Mitt Romney will win the state's Republican caucusesby double digits. Here's the makeup of voters: 4 of 5 are Conservative, 3 out of 4 said they were tea partiers, and 1 of 4 are Mormons. Where's Romney today? In Colorado Springs, campaigning for Coloradans' votes in the caucuses which will be held Tuesday.